This is the official logo for the Drug Enforcement Administration (DEA). Badge of the Drug Enforcement Administration. The Drug Enforcement Administration (DEA) is a United States Department of Justice law enforcement agency, a federal police service tasked with enforcing the Controlled Substances Act of 1970. Not only is the DEA the lead agency for domestic enforcement of federal drug laws (sharing concurrent jurisdiction with the Federal Bureau of Investigation), it also has sole responsibility for coordinating and pursuing U.S. drug investigations abroad. The DEA was created by President Richard Nixon through an Executive Order in July 1973 in order to establish a single unified command to combat "an all-out global war on the drug menace." At its outset, the DEA had 1,470 Special Agents and a budget of less than $75 million. Furthermore, in 1974, the DEA had 43 foreign offices in 31 countries. Today, the DEA has approximately 5,000 Special Agents, a budget of more than $2 billion and 86 foreign offices in 62 countries. Investigation and preparation for the prosecution of major violators of controlled substance laws operating at interstate and international levels. Investigation and preparation for prosecution of criminals and drug gangs who perpetrate violence in our communities and terrorize citizens through fear and intimidation. Management of a national drug intelligence program in cooperation with federal, state, local, and foreign officials to collect, analyze, and disseminate strategic and operational drug intelligence information. Seizure and forfeiture of assets derived from, traceable to, or intended to be used for illicit drug trafficking. 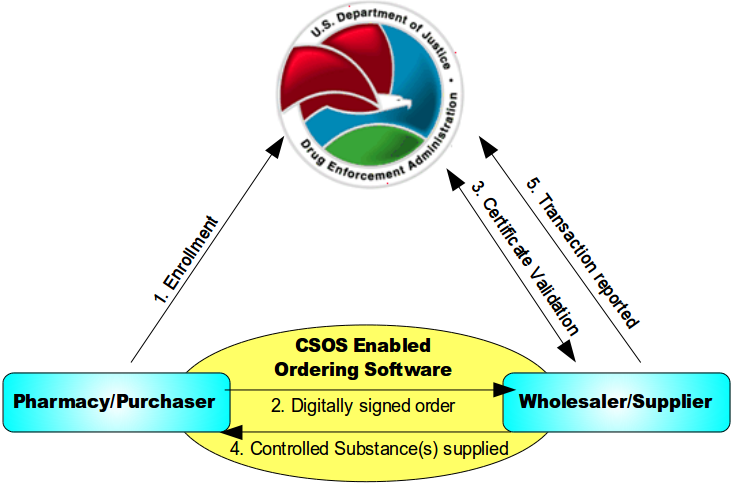 Enforcement of the provisions of the Controlled Substances Act as they pertain to the manufacture, distribution, and dispensing of legally produced controlled substances. Coordination and cooperation with federal, state and local law enforcement officials on mutual drug enforcement efforts and enhancement of such efforts through exploitation of potential interstate and international investigations beyond local or limited federal jurisdictions and resources. Coordination and cooperation with federal, state, and local agencies, and with foreign governments, in programs designed to reduce the availability of illicit abuse-type drugs on the United States market through nonenforcement methods such as crop eradication, crop substitution, and training of foreign officials. Responsibility, under the policy guidance of the Secretary of State and U.S. Ambassadors, for all programs associated with drug law enforcement counterparts in foreign countries. Liaison with the United Nations, Interpol, and other organizations on matters relating to international drug control programs. Codeine and codeine containing products in a solid dosage form (tablet, capsule, etc.). Nearly 7 million Americans were abusing prescription drugs in 2006—more than the number who are abusing cocaine, heroin, hallucinogens, Ecstasy, and inhalants, combined. That 7 million was just 3.8 million in 2000, an 80 percent increase in just 6 years. Prescription pain relievers are new drug users’ drug of choice, vs. marijuana or cocaine. Opioid painkillers now cause more drug overdose deaths than cocaine and heroin combined. 1 in 7 teens admit to abusing prescription drugs to get high in the past year. Sixty percent of teens who abused prescription pain relievers did so before the age of 15. 2 in 5 teens believe that prescription drugs are “much safer” than illegal drugs. And 3 in 10 teens believe that prescription pain relievers are not addictive. Twenty-five percent of drug-related emergency department visits are associated with abuse of prescription drugs. Methods of acquiring prescription drugs for abuse include “doctor-shopping,” traditional drug-dealing, theft from pharmacies or homes, illicitly acquiring prescription drugs via the Internet, and from friends or relatives. DEA works closely with the medical community to help them recognize drug abuse and signs of diversion and relies on their input and due diligence to combat diversion. Doctor involvement in illegal drug activity is rare—less than one tenth of one percent of more than 750,000 doctors are the subject of DEA investigations each year—but egregious drug violations by practitioners unfortunately do sometimes occur. DEA pursues criminal action against such practitioners. DEA Internet drug trafficking initiatives over the past several years have identified and dismantled organizations based both in the U.S. and overseas, and arrested dozens of conspirators. As a result of major investigations such as Operations Web Tryp, PharmNet, Cyber Rx, Cyber Chase, and Click 4 Drugs, Bay Watch, and Lightning Strike, tens of millions of dosage units of prescription drugs and tens of millions of dollars in assets have been seized. The Anabolic Steroids Control Act (ASCA) of 1990 gave the DEA authority over anabolic steriods. Anabolic steroids are defined as synthetic derivatives of the male hormone testosterone, having pronounced anabolic properties and relatively weak andronergic properties (i.e., producing masculine characteristics), which are used clinically mainly to promote growth and to repair body tissue in senility, debilitating illness, and convalescence. Anabolic steroids may also be referred to as andronergic-anabolic steroids. The DEA does report a decrease in clandestine methamphetamine labs since the passage of the CMEA. 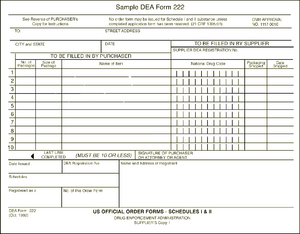 The Drug Enforcement Administration works closely not only with other law enforcement entities such as the FBI, Interpol, and local authorities but also the medical industry including physicians, drug manufacturers, and pharmacies to regulate both highly abusable street drugs along with medications that have great potential for patient benefit but also have considerable abuse potential. While the landscape in which the DEA operates has changed significantly in the past 40 years there task remains the same as when they were conceived, to combat drug abuse. This page was last modified on 2 June 2014, at 19:53. This page has been accessed 42,868 times.